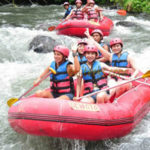 Firstly we will drive to Payangan Village to enjoy the white water rafting in Ayung River. After your lunch in finish point the tour continues to visit of Ubud Monkey forest and their beautiful temple with detail stone carved. After visiting monkey forest, take you to enjoy coffee break and see spices garden. The last place to stop is Tanah Lot temple that located in the ocean. Then back to Hotel.